Different types of insects, particularly gnats and mosquitoes, are attracted to standing bodies of water. After it rains, you might more of these insects hovering or even nesting around puddles of water in different objects. If you have a swimming pool on your property, gnats and mosquitoes can become a serious problem. Fortunately, you can successfully get rid of these insects with the right strategies. Get rid of anything near your pool that can collect standing water. This might include buckets, cans, tires, birdbaths and tarps. Clean any gutters on your home or garage that are near your swimming pool. Gnats and mosquitoes are attracted to wet and dirty gutters. Sweep your swimming pool with a pool sweeper often to keep the water clean. The dirtier the water and the more organic materials inside, the more attractive it will be to gnats and mosquitoes. Balance the water in your swimming pool using swimming pool chemicals. There are many different types of pool chemicals. What you use, as well as how much, will depend on your region, your climate, your water type and the time of year. Consult with your local pool store if you’re not sure. Deal with any swampy areas near your swimming pool. The accumulation of organic matter and water in areas that are muddy or have holes, such as from a tree stump that has been removed, will be attractive to gnats and mosquitoes. Use a larvicide or insecticide. 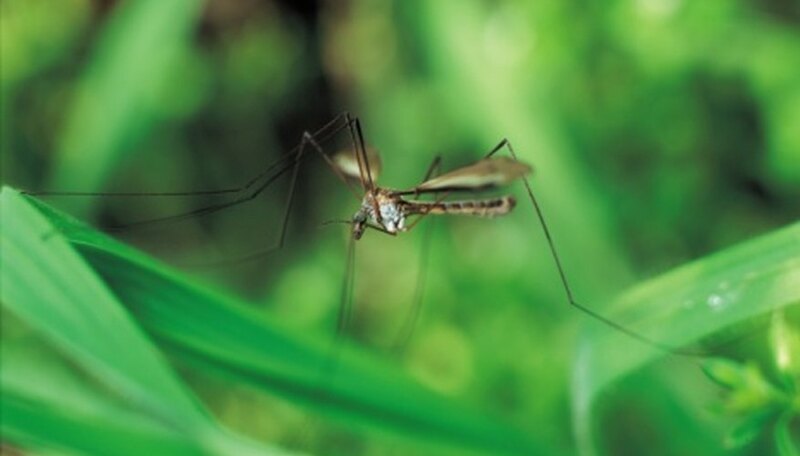 Look for those with the active ingredient Bti toxin, which will get rid of both mosquitoes and gnats that are attracted to water. These products can typically be applied to your swimming pool water, around the pool, and in areas near the pool that might attract mosquitoes and gnats -- such as under a deck or around a tree trunk.